I know that I’ve posted an inordinate amount of tomato recipes this year. That is due to a miscalculation early in the growing season. Or an inability to believe how large a small tomato plant (or 11) in an container can grow. 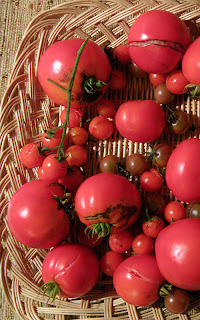 When the 7 Renee’s Garden Super bush container tomato seeds that I sprouted looked a little wimpy, I bought 4 more plants at an organic farm: two cherries, and Brandywine and Mortgage Lifter heirlooms. These varieties were not container friendly, supposedly. So I assumed that when forced to live in pots, their yield would be skimpy. Not true, like so many assumptions. One advantage of this miscalculation is the discovery of 5 tomato varieties that grow really well in containers. Another is the discovery of homemade stewed tomatoes, for which late season, oddly textured, non-cosmetically correct tomatoes are perfect. DIY stewed tomatoes are only remotely related to the oversalted, underflavored varieties that come in cans. Many late season tomatoes ripen unevenly and have strange spots, streaks, and black grooves. No matter for stewing. Just remove the odd looking striations and spots and any over-ripe areas with a knife. Then blanch them in boiling water to remove the skin (details below). 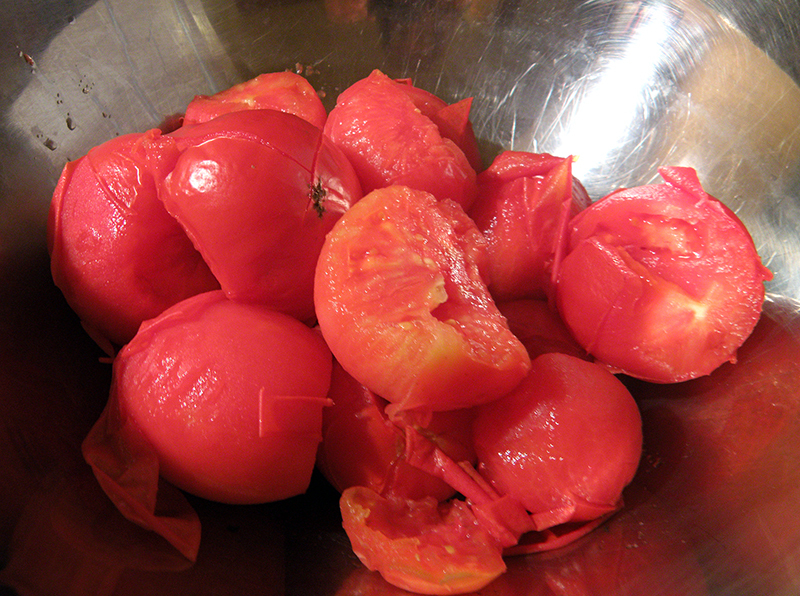 It’s true that if part of the tomato is cut off before blanching, the tomatoes can take on excess water. But since the tomatoes will be simmering, any excess water will soon evaporate. Late season heirloom tomatoes can be surprisingly sweet when stewed. I used a combination the Brandywines and Mortgage Lifters, plus a few of the Super bushes. If your stewed tomatoes seem a bit sharp or acidic, add a teaspoon or two of sugar, honey, or agave to round out the flavor (my Mom’s trick). This trick also works for earlier season tomatoes. I cut my tomatoes into a large dice, because these are the kind that I usually buy to use in wintertime recipes. You could choose instead to cut them into quarters or halves. I used ½ cup each of shallots (about 3) and celery (2 sticks). You could use the lesser amount or anything in between. Or add some green bell pepper in place of all or some of the celery. In any case, be sure to chop up these veggies very finely. This recipe is all about the tomatoes, the other ingredients add just subtle flavor. Try freezing these for winter use. If you double the recipe, you might find it practical to can them instead, using a hot water bath process. Or you could choose to eat some now and give the rest away. If using late season tomatoes, remove bad/over-soft parts and rotty blemishes. Cut an X in the bottom of each tomato, about ½ inch deep and 2 inches long. This will enable the skin to peel off easily. Boil some water in a 3 quart pot. 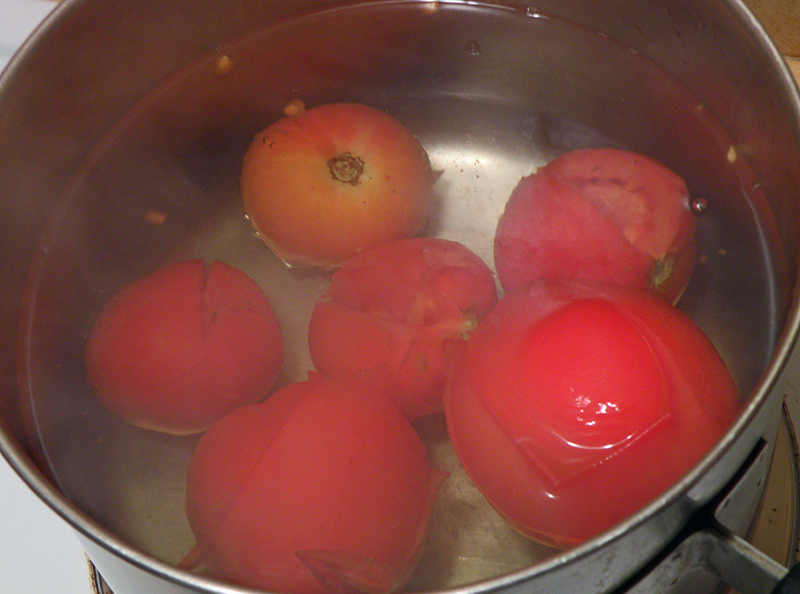 Drop tomatoes into boiling water a few at a time. Remove with slotted spoon after 30 seconds – 1 minute, and place in heatproof bowl. When cool enough to handle, slip skins off and cut out cores. Cut each tomato into halves, quarters, or thick dice depending upon size of your tomatoes and the size stewed tomatoes you prefer. Heat olive oil in 2 or 3 quart saucepan over medium high heat. Add finely chopped shallots and celery. Sauté until lightly golden, about 5 minutes, stirring constantly. 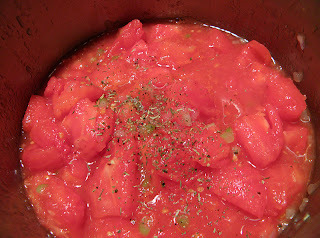 Stir in tomatoes, salt, and Italian herbs. Heat to boil, then turn down heat to low and simmer uncovered for about 25 minutes, stirring occasionally. Taste tomatoes. If they are too sharply acidic, sweeten with a little sugar, honey, or other sweetener. You may want to add more salt to taste as well.